Collection of the artist (until at least 1937). Louis G. Clayeux, Paris (by 1966). Fischer Fine Art Limited, London. Viktor and Marianne Langen, Meerbusch (acquired from the above, 1975). Derrière le miroir, no. 42, November-December 1951, no. 42 (titled Sur la plage). W. Grohmann, Wassily Kandinsky: Life and Work, New York, 1958, p. 345 (illustrated, p. 399, no. 605; titled On the Beach; with incorrect dimensions). H.K. Roethel and J.K. Benjamin, Kandinsky: Catalogue Raisonné of the Oil-Paintings, 1900-1915, London, 1982, vol. I, p. 282, no. 297 (illustrated). V. and M. Langen, Kunst des 20ten Jahrhunderts: Sammlung Viktor u. Marianne Langen, Ascona, 1986, vol. I, p. 17 (illustrated in color, p. 18). 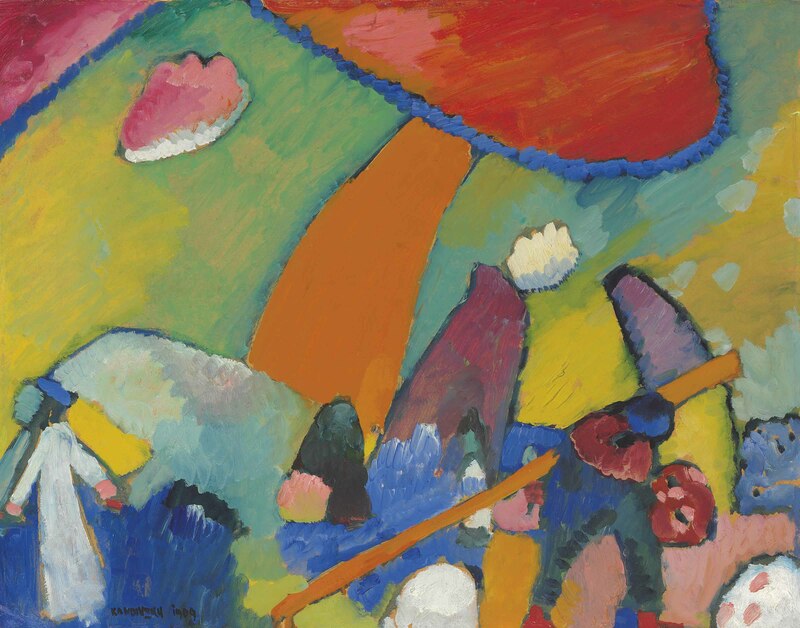 Dresden, Galerie Arnold and Berlin, Galerie Neumann-Nierendorf, Kandinsky: Jubiläums-Ausstellung zum 60. Geburtstage, October-December 1926, no. 4. Kunsthalle Bern, Wassily Kandinsky: Französische Meister der Gegenwart, February-March 1937, p. 3, no. 3. London, Guggenheim Jeune, Wassily Kandinsky, February-March 1938, no. 36. Kunsthaus Zürich, Georges Braque, Wassily Kandinsky, Pablo Picasso, September-October 1946, p. 8, no. 32 (titled Sur la plage; with incorrect dimensions). Amsterdam, Stedelijk Museum and The Hague, Gemeentemuseum, Kandinsky, December 1947-March 1948, no. 13 (titled Op het strand). Paris, Galerie Maeght, Wassily Kandinsky, 1900-1910, November-December 1951, no. 42 (titled Sur la plage). Paris, Musée national d'art moderne and Munich, Haus der Kunst, Le Fauvisme français et les débuts de l'Expressionnisme allemands, January-May 1966, p. 243, no. 185 (illustrated, p. 256; titled Am strand). Lugano, Museo Cantonale d'Arte, Kandinsky nelle collezioni svizzere, June-October 1995, p. 162, no. 11 (illustrated in color, p. 163). During the years from the autumn of 1905 through the end of July 1914, the eve of the First World War, events in the fine arts revealed that a revolutionary process, by one leap and bound after another, was well under way. The voices of avant-garde cadres, touting their various ideas and agendas, gathered in an ever mounting crescendo to proclaim the imminent triumph of modernism, the creative credo and quest that a young generation in a new century had embraced as its cause. The small band of Fauves, exploding their dynamite sticks of color at the 1905 Salon d'Automne, struck the first blow in what would prove to be a hard-fought knock-down bout against the far more numerous legions of conservatism and convention. By the late summer and fall of 1909, around the time Kandinsky painted Strandszene, the initial shock wave of Fauvism had passed through the art world, its reverberations having fanned the fires of expressionism in Germany and continuing to embolden new youthful movements in Russia. Back in France, Matisse had painted in 1909 the first version of La Danse (The Museum of Modern Art, New York), as Parisians were puzzling over the appearance of petites cubes in the paintings of Picasso and Braque. Possessing exceptionally prophetic and visionary powers, a few pioneers--Kupka, Mondrian, Delaunay and Kandinsky--had begun to set out along individual paths, tentatively at first, but with growing confidence and the occasional support of fellow travelers, toward what they believed should be the ultimate goal of the momentous ongoing modernist transformation, the creation of an abstract, non-objective manner in painting. There is a pencil drawing study for Strandszene (Barnett drawings, no. 113), which, although not dated, is inscribed with the name of an acquaintance who is also mentioned elsewhere in sketchbook notes dated August-October 1909. If in fact the painting Strandszene was done during this interval, it followed soon after Kandinsky completed the typescript in German for his book Über das Geistige in der Kunst (On the Spiritual in Art), which he dated Murnau, 3 August 1909. This treatise became the most famous and widely influential of all artists' books written during the 20th century. Kandinsky laid out in this eclectic text an ambitious and impassioned agenda for revitalizing the art of his time. It is clear from the tenor of his pronouncements that he had elected to undertake what amounted to a messianic quest--he was seeking to bring about the ascendancy of spiritual values over materialism in all aspects of human consciousness. "The great epoch of the Spiritual which is already beginning, or, in embryonic form, began already yesterday amidst the apparent victory of materialism, provides and will provide the soil in which this kind of monumental work of art must come to fruition. In every realm of the spirit, values are reviewed as if in preparation for one of the greatest battles against materialism. The superfluous is discarded, the essential examined in every detail. And this is happening also in one of the greatest realms of the spirit, that of pre-eternal and eternal art" (in ibid., p. 88). "3. The expressions of feelings that have been forming within me in a similar way (but over a very long period of time), which, after the first preliminary sketches, I have slowly and almost pedantically examined and worked out. This kind of picture I call a 'Composition'" ("On the Spiritual in Art" in ibid., p. 218). Kandinsky had not yet painted by the end of 1909 any pictures he called Impressions, although he had done and would continue to paint numerous works based on nature or showing figures in a landscape. Strandszene is a work precisely of this latter kind, which appears to straddle the divide between an "impression" and an "improvisation," insofar as it stems from the experience of nature, the world as observed and experienced, but also opens a pathway by means of an increasingly subjective and pre-abstract painterly idiom toward the "expression of an inner character." Such works would soon follow. Will Grohmann has noted that "The landscapes Kandinsky called 'Improvisations' occupy a special place in his works of the transitional period 1910-1912. They come closest to the ideas he developed in On the Spiritual in Art" (op. cit., p. 116). Kandinsky painted these remarkable, prescient pictures in an unlikely place, the small Bavarian market town of Murnau, on Lake Staffel at the foot of the Alps, about 44 miles (70 km.) south of Munich. Kandinsky first visited Murnau in 1904, while he was living in Munich. He and his companion, the painter Gabriele Münter, had spent most of the time from the end of 1904 to the summer of 1907 traveling and living outside Germany, first making a trip to Tunisia, with a return leg through Italy, returning there to spend the winter of 1904-1905 in Rapallo, before moving to Sèvres, a suburb of Paris, where they lived just over a year. There they attended the 1906 Gauguin retrospective, visited Ambroise Vollard's gallery, called on Gertrude Stein, and became familiar with the paintings of Cézanne, Van Gogh, Munch, Matisse and Picasso. The works Kandinsky submitted to the Salon d'Automne, however, had gone unnoticed, and he and Münter failed to develop any strong ties with other artists working in Paris. They returned to Germany, and lived for eight months in Berlin, before making Munich their base once again. During a cycling tour during the summer of 1908, Kandinsky revisited Murnau. He wrote in a postcard to Münter, "It is very, very beautiful...the low-lying and slow-moving clouds, the dusky dark-violet woods, the gleaming white buildings, velvety-deep roofs of the churches, the saturated green of the foliage, remain with me. I even dreamt of these things" (quoted in H. Fischer and S. Rainbird, eds., Kandinsky: The Path to Abstraction, exh. cat., Tate Modern, London, 2006, p. 209). He and Münter took rooms at a Murnau inn for the remainder of the summer, and returned to the town the following spring, in 1909. The great developments in early modern art often took place, not in the great cosmopolitan centers of Europe, but in small, out-of-the-way locales where painters could experience a quieter, more introspective and elemental way of life. Murnau would become for Kandinsky what Collioure had been for Matisse, or Horta del Ebro, Céret and Sorgues for Picasso. Kandinsky and Münter admired glass paintings and other folk art of the region, and they were only a few miles from Oberammergau, whose Easter Passion plays had been famous throughout Germany since medieval times. Removed from the bustle and art politics of Munich, Murnau became a retreat where Kandinsky could reflect and take stock of his ideas and his work. It was here that he finally assembled his notes, many of which he had been carrying around for years, and completed the German draft of On the Spiritual in Art. Kandinsky enticed two close friends, the Russian-born painters Marianne von Werefkin and Alexej von Jawlensky, to join him and Münter in Murnau. For the first time in two years Kandinsky was again involved in a circle of talented and mutually supportive artists. In January 1909, Kandinsky, Münter, Jawlensky, and Werefkin joined with the artists Alfred Kubin, Adolf Erbslöh and Alexander Kanoldt, as well as the art historians Heinrich Schnabel and Oskar Wittgenstein, to form the Neue Künstlervereinigung München--the New Artists' Association of Munich--known by the initials NKVM. Kandinsky was elected to serve as the group's first chairman. The inaugural NKVM exhibition took place in Munich during December 1909. Münter, in July or August 1909, purchased a house in Murnau, where she and Kandinsky could spend at least the summer months and other holidays as a welcome change of place and pace. They decorated the house with their own folk art-style designs, and because their Russian friends were frequent visitors, it became locally known as the Russenvilla. Strandszene was probably painted in the rooms of Kandinsky's and Münter's new house in Murnau, not long after they moved in. The hilly terrain around Murnau supplied Kandinsky with numerous motifs for landscape paintings, which he depicted in a less descriptive and specific manner than previously (Roethel and Benjamin, no. 303; fig. 1). For a number of years he had also been painting scenes that evoked Russia in olden times, but now he turned increasingly to lyric pictures and fantasies that were more generalized, timeless and symbolic in their aspect, frequently using landscape features from Murnau and its environs as a backdrop. "As if a gate had suddenly opened onto a new vista, Kandinsky now experienced a liberation in style that represented a drastic break with the recent past," Peg Weiss has written. "All at once, there seemed to be a way to resolve the dichotomy between his impressionist landscapes and the lyric works that had held his heart in thrall for so long... Kandinsky explained that his transition to abstraction had been effected by means of three major steps: the overcoming of perspective through the achievement of two-dimensionality, a new application of graphic elements to oil painting; the creating of a new 'floating space' by the separation of color from line" (Kandinsky in Munich, exh. cat., The Solomon R. Guggenheim Museum, New York, 1982, p. 59). While Kandinsky likely painted Strandszene in Murnau, the mountainous background and figure imagery in this picture did not originate in any local site. The nearby large lakes, the Starnbergersee and Staffelsee, like most bodies of fresh water nestled between mountains, lack a broad stretch of strand around their shores. Kandinsky appears to have instead worked from memories of beaches he had visited while traveling in Italy and Tunisia. The figure clad in a full-length white garment and others wearing black specifically suggest a North African locale, perhaps one of the beaches Kandinsky and Münter gazed upon at while staying in Bizerte, Tunis, Carthage and Sousse, which are popular resorts today. Paul Klee similarly journeyed to Tunisia in April 1914, during which he famously declared in his diary, "Color and I are one. I am a painter." Matisse made two eye-opening trips to Morocco before the war, during 1912-1913. During Kandinsky's stay in Tunisia between December 1904 and February 1905, the artist painted a series of street views, coastal landscapes and beach scenes, employing his post-Impressionist palette knife technique (Roethel and Benjamin, nos. 129-136). The curving arabesque along the upper edge of Strassenszene may suggest the ridges of the Bavarian Alps, but Kandinsky is perhaps also recalling the twin peaks of the Bourkonine mountains that lie across the bay from Tunis, which the artist has here exaggerated in telescoped, close-up scale. Other orientalist or North African subjects date from 1909, in which Kandinsky likewise channeled memories of his trip to Tunisia, most notably Araber I (Friedhof) and Orientalisches (Roethel and Benjamin, nos. 283 [Kunsthalle, Hamburg] and 294; the latter fig. 2). Skizze (Reiter) is an Arab horseman on a rearing mount of the kind that European orientalist painters liked to depict (no. 280). Allusions of this kind moreover permeate some of the Improvisations that Kandinsky had been painting concurrently in 1909 (nos. 275 and 287; figs. 3 and 4). This imagery easily comingled with the artist's subjects from old Russia (no. 288; fig. 5), a reminder that vast predominantly Muslim territories had been incorporated within the Tsarist and later Soviet empires. These varied pictorial resources reveal Kandinsky's perceptive appreciation of the diverse nature of Russian culture, and demonstrate his preference for expressing an inclusive, synthetist outlook in artistic and spiritual matters. These orientalist motifs moreover provided Kandinsky with an authentic and universally timeless backdrop of the kind he required to depict his quest for the spiritual realm in both art and life. The ascending column of brilliant orange, a deep saffron--the color of a Buddhist monk's robe, a new dawn--is the central pictorial element in Strandszene. It represents the path of renunciation and dedication to purity one must locate amid the material pursuits of everyday life, as shown in the lower portion of the composition, and follow beyond the distant ridge of the phenomenal world, to discover that place where the essential mysteries of human existence may contemplated, experienced and perhaps even understood. This is Kandinsky in his role as seer and prophet, as he would read and admire in the Revelations of Saint John, writ some eighteen hundred years before the artist's time. Such mystical and spiritual concerns were everywhere in the air during the early years of the 20th century, especially in Russia, which Kandinsky incorporated into the ideas he discussed in On the Spiritual in Art. "Kandinsky's concept of the spiritual realm was an amalgamation of ideas derived from numerous Symbolist and Theosophical sources," Rose-Carol Washton Long has written. "The ideas of [Stefan] George, [Karl] Wolfskehl, the Russian religious movement espoused by Bulgakov and Berdiaev, the Symbolist ideas of Bely, Ivanov and Merezhkovsky, and the Theosophical ideas of [Rudolf] Steiner all played a crucial part in shaping Kandinsky's messianic vision. All of these men took an apocalyptic view of history and attached great importance to The Revelation to John. Not only Steiner, but many of the Russians believed that an eschatological upheaval was at hand. Many of the Symbolists, such as Bely, actually believed for a while that the Russian Revolution of 1917 was the cleansing spiritual apocalypse of which they had dreamed. With all the emphasis placed on The Revelation to John as a secret document containing the key to the understanding of the future, it is not surprising that Kandinsky began to use apocalyptic motifs around 1910 to convey the utopian promises of the colourful 'spirit-land'" (Kandinsky: The Development of an Abstract Style, Oxford, 1980, p. 41). As in the synthétiste works of Gauguin, whom Russian artists admired for his interest in eastern, non-European cultures, Kandinsky emphasized the role of color no less than the development of new forms as he advanced toward his goal of achieving a non-objective manner in painting. Kandinsky forged in his landscapes and related subjects of 1909 a distinctively Russian brand of Fauve colorism, which is also manifest in the concurrent work of Münter and Jawlensky. The deeply resonant chroma that Kandinsky and his closest colleagues preferred to employ in their canvases moreover stemmed from shared and deeply ingrained traditions rooted in their native decorative and folkloric arts. The Russian painters made their experience of light, as transformed into color, a far more intensely emotional process than did the French Fauves. Color, for the latter, was an observable and translatable phenomenon of nature, which since the pioneering work of Seurat and the Neo-Impressionists had acquired a formal basis grounded on scientific fact and theory, information that could be utilized, even altered to some extent, to suit their pictorial rationale. The Russian painters cultivated the powers of expression they discovered in color for reasons that were inseparable from their spiritual conception of the world and their needs to express these ideas symbolically; for the Germans, the will to color took on an overridingly personal and psychological bent, which fostered the most subjective expression of all, which the Russians at work in Germany also shared to some extent. Kandinsky is rarely given sufficient credit for being the superbly innovative and expressive colorist that he was, particularly at this remarkable stage in his career, perhaps because his increasingly abstract formal vocabulary makes it more difficult to make direct comparisons with the overtly physical representationalism of French figure painters like Picasso and Matisse. Kandinsky created the earliest of his milestone Compositions in 1910. The first three, painted that year, are no longer extant; only black and white photographs show us today how they looked), while a few surviving painted sketches permit us some idea of their coloration (Roethel and Benjamin, no. 326; fig. 6). When studying the surviving Composition IV, 1911 (Roethel and Benjamin, no. 383; fig. 7), we witness Kandinsky's use of color separated from line--as Peg Weiss described above--which that artist practiced increasingly as he pressed forward to the very brink of abstraction. The important role of pictorial elements found in such predecessor paintings as Strandszene becomes apparent. The steeply arched mountain-form remains the artist's chief compositional element; elsewhere figures morph into ascending pinnacles and towers, which echo the mountainous core of Composition IV. Kandinsky uses linear motifs--in the present painting, the pole-like object the workman is dragging at lower right--to anchor and stabilize the more freely rendered forms that comprise the totality of the composition. The method Kandinsky employed in both paintings to generate color for maximum effect remains essentially the same, relying on tinting with white to achieve the brilliant tonal intensity he required, while in Composition IV he also set down whitened passages to space apart and thereby harmonize the most strongly contrasting hues. He has taken the linear color contours that separate the Gauguinesque color zones in the 1909 Strandszene, and freed them entirely two years later in Composition IV, where they serve as integral graphic elements that impose an improvised semblance of structure on the artist's floating proto-abstract imagery. They also begin to function as shorthand pictorial signs, allowing Kandinsky to strip down and veil his imagery to the point where the object, though still relevant, becomes increasingly unrecognizable. Kandinsky completed the process of de-materializing the object during 1911, having transformed the composition into a purely pictorial entity, in which color=form, color+form=content. The sum content is the painter's expression for its own sake. We recognize these paintings to be Kandinsky's first truly non-objective, abstract works--and, as the artist himself pointed out, the first ever created by any painter (fig. 8). "The more freely abstract the form becomes, the purer, and also the more primitive it sounds," Kandinsky stated. "Therefore, in a composition in which corporeal elements are more or less superfluous, they can be more or less omitted and replaced by purely abstract forms, or by corporeal forms that have been completely abstracted. In every instance of this kind of transposition, or composition using purely abstract forms, the only judge, guide and arbitrator should be one's feelings. Moreover, the more the artist utilizes these abstracted or abstract forms, the more at home he becomes in this sphere, and the deeper he is able to penetrate it. The spectator too, guided by the artist, likewise increases his knowledge of this abstract language and finally masters it" ("On the Spiritual in Art" in K.L. Lindsay and P. Vergo, eds., op. cit., p.169). Kandinsky was not yet ready, however, to achieve the pictorial state of abstraction in 1909. He wrote in 1914: "As yet, objects did not want to, and were not to, disappear altogether from my pictures... One can philosophize about form, it can be analyzed, even calculated. It must enter the work of its own accord, and, moreover, at that level of completeness which corresponds to the development of the creative spirit...I was not sufficiently mature to experience purely abstract form without bridging the gap by means of objects. If I had possessed this ability, I would have created absolute pictures at that time" ("Cologne Lecture" in ibid., p. 396). During the feverish chronology of events and ideas that spread throughout Europe during the years leading up to the First World War, Kandinsky created an artistic legacy that would eventually transform the art of his time, and still informs and guides our contemporary sensibility, having irrevocably altered the ways in which we look at art, internally within ourselves, and externally at the world. The birth of modernism one hundred years ago, and the attendant emergence of abstraction as an art form of unbounded potential, may eventually become--if many do not already consider that period as such--a fabled golden age in the arts of our times. Wassily Kandinsky in Bavarian costume, standing in the fields outside Murnau, 1910-1911. Photograph by Gabriele Münter. Sharon Kim, International Director, Impressionist & Modern Art, discusses Wassily Kandinsky’s Strandszene, to be offered in the upcoming Impressionist and Modern Art Evening Sale on May 6.